The summer solstice hit on Monday, which means we officially experienced the longest day of the year…and if you live in the arctic circle, the sun never set! This week also officially means summer is here. Temperatures have been uncharacteristically hot in Denver, and we’re feeling the excitement of summer plans, whether they involve travel, staycations, starting new hobbies, spending time with family and friends, or just taking a moment to enjoy the day. Summer also means sales. Why? Because as we move into long, summer days, there is more time for leisure, fun, and of course, shopping for all of the products you need for your summer journeys. Our customers have been eyeing all of our products in anticipation of the Summer Sale, where you can get up to 65% off on certain items. We’ve collected the 5 top-ranked items under $50 based on customer reviews, ratings and recommendations. These are your summer must-haves and now is the time to buy. You deserve it for witnessing another orbit around the sun! The JanSport SuperBreak Backpack is a universal favorite. It’s musical festival ready, bike-friendly and primed for smart shoppers who are getting a head start on Back to School Shopping! Look, you’ve probably owned a Jansport if you went to Elementary school. The good news is, now your entire family can have one. This is a number one selling bag and there is a color or pattern for everyone (53 and counting). These backpacks are starting at $29.99! 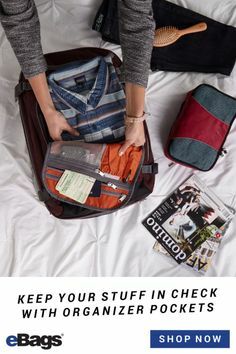 This anti-theft bag by Travelon is the next travel buddy you should consider investing in. It was designed with RFID blocking technology which helps keep your personal information safe from pickpocketers. Besides that, this crossbody is perfect for the simple gal living a very minimalist, yet on-the-go lifestyle. 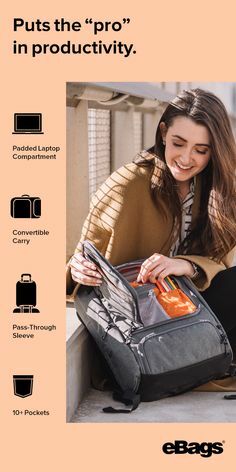 Our customers absolutely adore it for airport travel because it’s comfortably stored on your body with a compartment for every single item you bring with you. Plus it’s on sale from $49.99 to $31.99 and comes in four colors. Rejoice. Packing cubes have been one of the most popular products on eBags since the beginning of time. We often hear the phrase, “once you go packing cubes, you don’t go back.” It’s true. 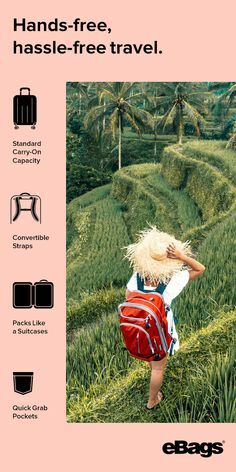 Packing cubes are the #1 recommended packing accessory from travel experts around the world. Our customers tell us they buy a different color for each member of their family and pack different themes in each sized cube – for instance, large pants and jackets in the big cube, toiletries or undergarments in the smaller tube. If you don’t have them or need a gift for almost any occasion, they are currently on sale from $85 to $39.99. This Value Set + Shoe Sleeves is worth every cent. It comes with sleeves for your shoes – keep the shoes safe; keep everything else clean. Can’t argue with THAT logic! This bag is notorious for the work-hard-play-harder mentality and that’s exactly why it’s so popular with our customers. It’s cool enough for school and savvy enough for professionals. So here’s what usually happens. Jane buys the bag for her husband’s commute to work. Jon takes said bag on their trip to Africa. Jane falls in love with bag. Jane buys bag for self. So be like Jane and check out this bag while it’s on sale. 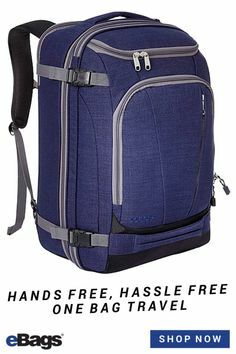 The SwissGear Travel Gear ScanSmart Backpack 1900 (was $130 now $64.99) also features TSA intelligence with lay-flat technology, audio connectivity, and a pretty sweet ventilation system. Click here to read more about how this pack can seriously change your life. Happy summer and happy sales! May the sun shine on. LoungeBuddy helps you take advantage of the small pleasures in airports…namely, the luxurious airport lounges…without having to be a veteran frequent flier. Did you know many airport lounges allow anyone to buy a one-time pass to the lounge to rest, work, recharge, eat and drink, or nap? LoungeBuddy has over 100 partner airports all over the world, and can easily help you find a free or low cost lounge whenever you travel. These days, it’s almost priceless to be able to get away from a crowded airport and enjoy a moment of solace in your own private airport oasis! With this app, it’s affordable and easy. Loungebuddy works at over 2,500 airport lounges and helps you find, book and access your lounge in just 60 seconds through the app (available in the Apple and Android stores). You can also read ratings and reviews and see photos and amenities from within the app so you can pick the right lounge! If you already use other apps like Concur or TripIt to manage your itineraries, LoungeBuddy automatically syncs with both partner apps and pulls your reservation data in to determine which lounges you can access, and at what cost. Slick! It’s our favorite time of the year: barefoot season. Is there anything better, more freeing, than the feeling of walking around, inside and out, totally barefoot? We don’t think so. For most, we want to feel like we are barefoot without having to go through the hardships of actually being barefoot. That’s why we are OBSESSED with Xero Shoes. They are the barefoot runner’s dream without the trials and tribulations of attempting to enjoy the feeling of bare skin on pavement! And for those of us who don’t care to run, Xero barefoot shoes allow you to experience the freedom and fun of achieving natural movement in your feet. It’s a game changer! Xero Shoes is a fellow Colorado company that has used its rugged landscape and access to athletes and runners to inspire the creation of the most versatile shoe on the planet. While numerous companies have produced several renditions of “barefoot shoes or sandals”, the Z-Trail Sandal is hands-down (or should we say feet-down) the best in show. In fact, it weighs less than every competitor shoe on the market and has used technology to eliminate hot spots and other imperfections of other barefoot or minimalist shoes. Xero is simply your feet’s new best friend. Don’t let the “naked” feel fool you: their exclusive FeelTrue sole is so flexible that you will not only get the fun benefits of being barefoot…but it will come with the perfect amount of protection and comfort! This minimalist sandal was designed with a 3-layer sole: a hard-wearing FeelTrue Rubber outsole, a durable TrailFoam midsole, and a comfortable-on-skin BareFoam insole. The different layers provide barefoot lovers the most comfortable underfoot experience to date. All barefoot love aside, this sandal is ideal for travel. It’s flexible enough to roll up and fit into your back pocket, and so low profile that they take up next to no space in your bag. And that’s only if you ever decide to take them off! Not only is it the best travel shoe for packing purposes, it is also perfect for any activity. Whether you hike, walk, run, jog, workout, Crossfit, yoga, raft, stand up paddle board, kayak, canoe, fly fish, or even run in long distance marathons — you name it and the Z-Trail Sandal can handle it. It’s durable enough to take you anywhere you want to go and comes with a 5000-mile warranty. Compare that to running shoes, which you’re supposed to replace every 300-500 miles! Are you a runner? Click here to read why barefoot running could just be the golden ticket you’ve been looking for to saving your body physically. Now that we’ve blown your socks off (literally and figuratively), it’s time to buy a pair of these awesome sandals! Nothing revives the soul like some sunshine and green trees. The National Park Centennial provides an excellent excuse for your family to embrace the great. What’s more? This isn’t just a family-bonding exercise; it’s beneficial to your family’s health and brain functions. National Geographic recently published findings of how a little greenery goes a long way – which describes how nature significantly calms people down and sharpens their mental performance. In 2009, a Dutch research team found that people who live within half-a-mile of green space have a lower instance of 15 diseases- including anxiety, depression, asthma, heart disease, and migraines. But only 10% of American teens spend time outside every day! Thanks to science, there’s no excuse not to adventure outside of the city limits. Grab some snacks, ditch the iPads, and spend a night in a National Park this weekend. Science promises you’ll come back feeling like a new family. Zion National Park was established in 1919, and “Zion” literally translates to a place of peace and refuge. This 147,000-acre oasis is only a 2.5-hour drive from Las Vegas, 5 hours from Salt Lake City, or 6.5 hours from Los Angeles, making it the perfect weekender option. Go for a swim in one of Zion’s creeks, or snap Christmas-Card material photos in front of Zion’s 3 Apostles carved out of rusty Navajo sandstone. Zion boasts a lodge inside the park, allowing you to pack light in the eTech Motherlode Wheeled Duffel (find out how to win one below!). Staying at the lodge lets you ditch the camping gear and accompanying headache of setup and takedown. Now you have more room for activities! Pack board games for evening entertainment, and rent bicycles from Zion Lodge for daytime fun! A fantastic introduction to Zion National Park is the Zion Canyon Overlook Trail, a short 1-mile out-and-back trail with a super sweet payoff. The path takes you to slabs of sandstone where you can sit and absorb an Instagramable panorama of Zion National Park – red stone flanking valleys of pine trees and meandering roads. This view is particularly spectacular at sunset. However if you have young kids or are afraid of heights, please be wary that guardrails are sparse….you’ll literally be living life on the edge. If your kids are older, or at least more coordinated, Zion is infamous for its Narrows trails. Here you’ll find a Subway that isn’t edible nor a form of transportation. Centuries of fresh water have carved the sandstone into an all-natural waterpark. Access the Narrows via the Riverside Walk. Be sure to wear waterproof, sturdy shoes for the hike. Bring walking poles for stability and the DENY Zion towel to dry off. Zion offers something for every age, from rock climbing to horseback riding to simply picnicking. No matter which route you choose, Zion will lead you to an elevated state. So skip town for a night to take part in the National Park’s 100th birthday celebration! To commemorate our National Parks, eBags and Deny Designs are supporting Zion National Park this week with an incredible giveaway to help you enjoy the zen of Zion just a little bit more! One #blessed reader will win the eTech Motherlode Wheeled Duffel, Packing Cubes (proven to preserve sanity), and DENY Designs Zion “WanderLove” package this week. Enter now! It shouldn’t come to a surprise that Tumi has one of the most loyal brand followings in the industry. 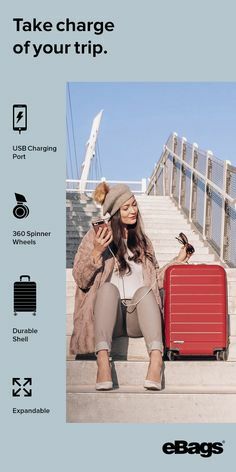 The name “TUMI” is synonymous with top rated bags that travelers can always count on for durability, practicality, and of course, major street style points! What’s more, Tumi’s state-of-the-art bag collections are built to weather a lifetime of adventures. This is a classic case of you get what you pay for. The TUMI brand stands by its name and in this case, it’s simply worth the price tag to have the best of the best. However, getting a TUMI bag on sale is just the icing on the cake, and it doesn’t happen very often. So perk up and pay attention! Right now at eBags you can take an additional 20% OFF your entire Tumi order! Hurry fast, offer ends 6/14. Here are the TUMI brand top 5 best sellers! Besides its noticeable artisan design, the Alpha Bravo Kingsville Deluxe Brief Pack ($369) is unlike any other pack on the market! For starters, it has an open slit in the back which allows you to slide it over the handles of your suitcase. So, when you’re tired of carrying it on your back – problem immediately solved. Secondly, we love the extreme mobile innovation that’s going on here. There’s a very convenient magnetically closed spot for your phone and it’s super easy to access. While there are a ton of pockets for organization, we think the most noteworthy mention is the main compartment. It features separate laptop and tablet pockets and, there’s even enough room for a packing cube. Go ahead and pack those “just in case” items. There’s room for everything in this bag. Meet the best-selling backpack in the Voyageur collection — the Voyageur Calais Backpack ($345). Artfully constructed and stylistically perfected…and we aren’t just saying that. 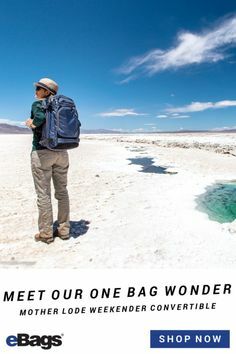 This bag is the end product of deep research, development, and production of high-performance materials that make this bag a best seller in this category of bags. It’s simply just a bit better than almost anything else out there. Case in point: this bag was made with 100% nylon material in black and gold and features leather trim accents! The nylon material makes it incredibly lightweight to carry and gives you even more flexibility while it’s on your shoulders. Not only that, but it’s extremely durable and basically waterproof. Spill some coffee on your bag? No sweat. Get caught in the rain? No biggie. This beautiful bag has been a constant companion since I ordered it. It’s expensive and completely worth it. 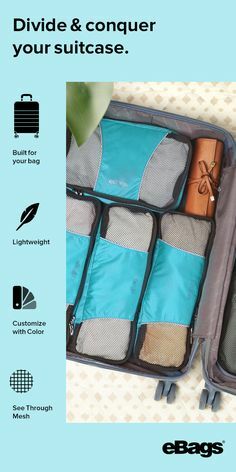 Great for work travel and personal travel, alike. You know how hybrid cars are so quiet you can’t even hear them drive by? Expect the same silence out of the Alpha 2. In fact, the Alpha 2 International Expandable 4 Wheeled Carry-On ($625) has more than 14 patented and trademarked Tumi components. It’s basically a walking lab experiment that went very, very well. It’s the perfect example of how the brand continues to make the best better, with every single new product. You can push it, pull it, roll it, drag it or glide it along however you wish. It silently obeys your wishes and is your trusty partner through the journey. Additionally, it features the “add-a-bag clip” capability which makes it super easy to slide your Alpha Bravo Backpack right over it. Major functionality points for this one. The Tumi Vapor Lite Large Trip Packing Case ($345) is currently the largest piece of luggage in the Vapor collection. Given its size, it’s surprisingly lightweight and extremely easy to maneuver. It’s actually the lightest hardshell suitcase to date and it’s currently being sold at a steal of a price! 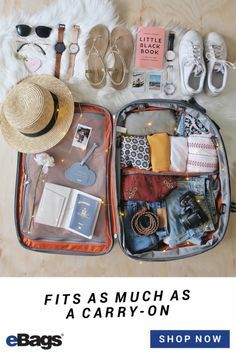 There has never been a better suitcase if you need something that can fit a lot of clothes and accessories, and still look good in transit. Read more about Tumi’s Vapor Lite Luggage Collection! With the Vapor Lite Collection being known as the Lamborghini of luggage, it shouldn’t come to a surprise that the Vapor Lite International Carry-On is also a top 5 best seller. That said, we don’t always need a giant suitcase every time we travel, so if you’re in the market for something smaller – get the Vapor Lite Carry On ($285). And trust us when we say, “You’ll never have to be in the market for carry-on luggage again!” Once you go TUMI, you can’t go back. And what’s more, you don’t need to. Shop Tumi now and save an extra 20% OFF your purchase! Here at eBags, we’ve embraced the concept of wanderlove. We believe the journey is something to be coveted and enjoyed and we like to help our community of wanderlovers prepare for each journey with the best products on the planet. So when we say we’ve “fallen in LOVE” with a certain product, we mean it! The pieces in Kate Spade’s summer sixteen collection are bright, whimsical, and scream adventure, travel, and love! Speaking of love, did we mention you can take an additional 25% off now through 6/14?! Consider it our gift to you this summer! Say hello to your new Flights of Fancy Hello Hallie Bag ($348)! There’s not much convincing to do when the bag is already speaking to you (literally). Fair warning, the color is so mouth-watering it might make you crave watermelons on the beach! Oh, and if that parrot doesn’t scream it’s 5 o’clock somewhere, then I don’t know what does. Leave it to Kate Spade to take the classic hoop earring and make it incredible. The Sparkle Hoops ($58) are sun-kissed and dipped in gold…AND they match your new bag. Yes. Yes. Yes. If your current makeup bag has seen better days, give it the upgrade it deserves with this Floral bag in Surprise Coral ($68). This bright treat will greet you every morning and remind you that you are so worth the little pleasures in life. Go ahead, leave it out for others to admire. We dare you. We’ve never seen a watch that has traded text for numerical numbers and we’re just eating up this creative statement piece. Go ahead and put the Leather Metro Watch ($195) in your shopping cart and expect compliments every time you wear it. Perk: It’s water resistant! We all need daily reminders to slow down, relax, and every now and then take a vacation. Let your phone case serve as that reminder to you and anyone you encounter! Get the I Need A Vacation Glitter iPhone 6 Case ($40) and start planning for your next trip! Bonus points: anyone who sees this case will crack a grin. It’s a fact. Don’t forget to take an additional 25% off when you shop Kate Spade through eBags.com!